The PFF team is going position-by-position to preview the 2017 college football season as it pertains to the 2018 NFL draft. There’s still a lot of football to be played and the evaluation stage is still very young, but a number of prospects are already on the NFL’s radar and you can read up on over 300 of them (to go with PFF signature stats on over 2,200 total prospects) in our first ever Preseason NFL Draft Guide. Last year’s tackle class lacked the usual big names and only two tackle were drafted in the first round. The 2018 draft class looks better on paper (or in PDF form in your 2018 Preseason Draft Guide) heading into the season. Texas’ Connor Williams can do it all, from run blocking at the point of attack, to locating second-level linebackers to pass protecting where his pass blocking efficiency of 99.2 led the draft class last season. Notre Dame’s Mike McGlinchey is a powerful run blocker with NFL size and he’s still getting better after having success both at right tackle and left tackle. Oklahoma’s Orlando Brown uses his massive size to move defenders in the run game while his 98.9 pass blocking efficiency ranked fifth in the class. At guard, Notre Dame’s Quenton Nelson will hold down the left side with McGlinchey. He’s a mauling run blocker, either at the point of attack or on the move, and his 90.2 overall grade ranked fourth in the nation in 2016. The one other first-round candidate to keep an eye on is Arkansas center Frank Ragnow who was the nation’s top-graded center at 93.4 last season. He had the second-highest percentage of positively-graded blocks in the run game and the lowest percentage of negatives among draft class centers. Northern Illinois OT Max Scharping allowed outside pressure once every 428 pass block attempts, best in the draft class. Houston OT Na’ty Rodgers ranked third in the draft class with a pass blocking efficiency of 99.0. 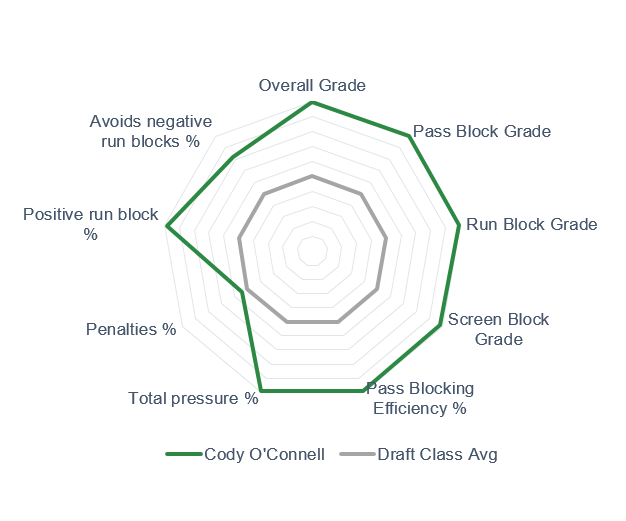 Washington State OG Cody O’Connell ranked second in the class with a pass blocking efficiency of 99.3 and he did not allow a bullrush pressure all season. Mitch Hyatt, OT, Clemson: Hyatt stepped right in as a true freshman starter and held his own before showing even better last season as a true sophomore. He’s yet to completely look like a top-round selection, but he rarely loses in the run game and creates good movement at the point of attack, particularly as part of double teams. He needs to progress in pass protection where his 96.2 pass blocking efficiency ranked 61st in the class last season. 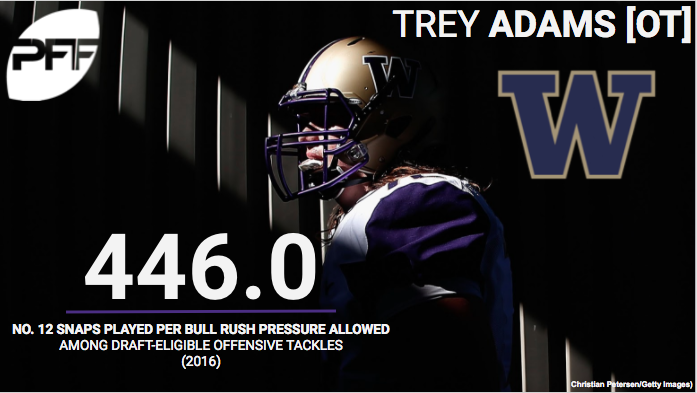 Troy Adams, OT, Washington: We’ve already seen Adams take a big step forward, improving his overall grade to 78.2 in 2016 from 40.8 in 2015. He has good size, length, and movement skills (evident in the screen game), so it wouldn’t be far-fetched to see even more improvement to his game. Colby Gossett, T/G, Appalachian State: The top-graded run blocking guard in 2015 at 90.8, Gossett has had success playing both right guard and right tackle. He has NFL size at 6-foot-6, 315-pounds and he has three years of strong grading (83.7 in 2014, 89.7 in 2015, and 86.5 in 2016) under his belt.